ViewRanger has been used by British-based mountain and lowland rescue teams for a number of years, as it has been proven to assist in search navigation, team coordination (using BuddyBeacon™ location sharing) and keeping a record of search patterns. It has also been easy to deploy using the smartphones already owned by team members, as well as flexible to integrate with search dog location trackers and with GPS radio devices. So when we were approached by our first US-based team, Daviess County, KY Search and Rescue (SAR) Team, we were confident that ViewRanger could meet their requirements. This team initially used ViewRanger for their K9 unit (dog handlers) and has since expanded the rollout to include more of their ground personnel. Apparently, the word is getting out about ViewRanger! Recently, we were approached by a Western North Carolina Fire Department to exclusively use our app for their five-day SAR training exercise this past March on the grounds of the acclaimed Biltmore Estate. Hosted by the Skyland Fire Department, the event drew 50 teams from 6 states, which equates to approximately 300 Search & Rescue professionals in total attendance. The objective of the training was to improve search and rescue skills and incident management skills using a series of exercises. 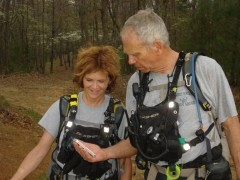 We are delighted to say ViewRanger was used to support navigation, team coordination and gather data. Best GPS for fire rescue use! We thank the organizers for using ViewRanger at the training event, and look forward to engaging further with many teams. If you work with a SAR team and are interested in learning more about ViewRanger, please contact Margie Cohen at margie@viewranger.com.